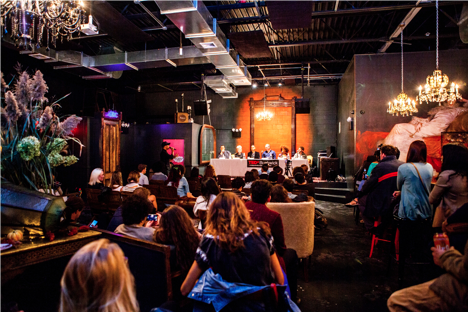 A panel at TedxBushwick 2015. Photo Courtesy of TedxBushwick. Bushwick's local Tedx chapter has announced its 2016 lineup—and it's nothing if not dynamic, with presenters ranging from a New York City civil rights attorney who will speak about police and community relations to the executive director of Clowns Without Borders. This year's lineup, organized around the theme of "creative collaboration," seems to have taken into account community feedback given after last year's conference: the presentations also share a theme of inclusivity with talks entitled "Tech for Equity," "Facing your Fears Facilitating Community," and "Collaborative Opportunities are Everywhere." "TEDxBushwick 2016 invites you to focus on big ideas relating to partnerships, groups and organizations - the intimate experience of human collaboration where ideas are born, developed and spread," the organizers explain. TedxBushwick 2016 is the neighborhood's second annual Bushwick Tedx. "This year our volunteer base of 12 has organized two panels, one live stream, a speaker vetting and feedback process over six months which included three workshops, three individualized coaching sessions, and a rehearsal. All volunteer based," TedxBushwick organizer Lori Corpuz tells Bushwick Daily. In addition to the presentations, attendees can look forward to receiving their own TedxBushwick notebooks with which to take notes about the talks, a fire performance, an aerial performance, and a new Artist in Residence program for which a Bushwick native has produced an art installation for the TEDxBushwick stage. TedxBushwick 2016 takes place at Bushwick's House of Yes, is scheduled for Saturday, March 26th from 9am-5pm. Tickets are for sale here, and attendees can RSVP on Facebook (more than 100 people are already planning to attend). Bushwick Daily's founder and editorial director Katarina Hybenova was part of a "conversation" panel at last year's TedxBushwick conference.